The design of your office layout can reflect your corporate culture and mission. You should tailor your office layouts and designs to complement the type of atmosphere you want to achieve. For example, open office layouts with low panel heights create an environment that focuses on openness, collaboration, visibility, and communication. Offices with higher panel heights provide workers with plenty of privacy. Many office layouts have a combination of both types of spaces depending on the type of work being completed. Other offices opt for a mid-panel height to create an open feel while still providing workers with their own sense of space. Space planning is a big undertaking, as there are several factors to consider with office design ideas; physical restrictions of the space, accessibility, the diversity of your team and team roles, lighting, and sound pollution. In fact, unwanted noise is almost universally reported by employees as the number one deterrent to productivity and satisfaction at work. One way to combat audible distractions is to consider zoning out your office. Keep those that spend ample time making phone calls farthest from those whose role require the most amount of concentration or attention to detail. For instance, keep some distance between your customer support team and your programmers or engineers. Space planning is all about solving problems before they arise, and we have plenty of helpful professionals and tools to help you do so. 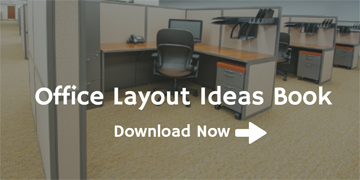 Interior Concepts is here to help you create the best office layout for your company. We start with adding your requested office furniture design into your office floor plan and working with you online over an ImagineIt! design session to modify your office layout ideas design live so you can see how the furniture will look in your space. In just a few steps you can go from office design ideas to seeing a 3D virtual tour or your space. We bring our 20 years of design expertise to the table to help you create your perfect environment.